Takeaway: Attempts to present a pastoral understanding of Bonhoeffer to the lay person. Not sure it accomplishes it. And the audio was off putting. So read, don’t listen. Bonhoeffer is a hero to many, but few people actually read much more than Life Together or Cost of Discipleship. Bonhoeffer is not always easy to read. He was an academic and some of his writing (and a lot of the writing about him) was/is intended for the academic world not the general Christian world. John Matthews has entered the fray to write as a pastor, with a strong academic background in the Bonhoeffer studies, a short book about Bonhoeffer’s spirituality and theology. I listened to it because Audible.com had it on sale for less than $5. It was just over 2 hours of audio. Simon Vance was the narrator. Normally I try to review the audio quality and narration separately from the content. But in this case it really affected the content. What was supposed to be pastoral and easy to understand, ended up being pretentious and lofty. Vance is a good narrator, but a bad choice for this project. He has a British accent and is very exact in his diction and pronunciation. That did not make listening to a pastoral approach better. And I do not think it is the British accent, but something about the tone and reading method. I find John Stott and NT Wright incredibly pastoral in tone. In fact I prefer listening to both of them over reading them because their passion as pastors really carries through their speaking in much stronger ways than it does through their writing alone. This book tried, but in the end I felt it had some of the weaknesses of Metaxas biography. It was trying to put Bonhoeffer in an Evangelical mold. 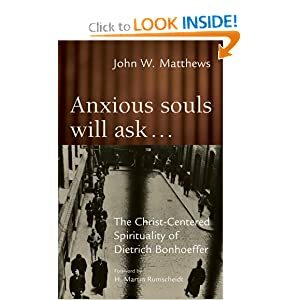 Matthews is a Lutheran and so I think has some insight into Bonhoeffer’s Lutheran-ness that was useful. And overall I am glad I listened to it. But many books about Bonhoeffer make me want to read Bonhoeffer. Which is not all bad. But they are not that convincing to me that they actually presented “the real Bonhoeffer”. He is definitely one of my heroes. I discovered “The Cost of Discipleship” while in college. This sounds like an interesting book. Even with the twist he might have placed on Bonhoeffer’s life.